Schwarze Industries, based in Huntsville, Ala., recently presented an innovative new design in street sweepers to its national dealers in Birmingham, Ala.
Schwarze Industries, based in Huntsville, Ala., recently presented an innovative new design in street sweepers to its national dealers in Birmingham, Ala. Tractor & Equipment Company, the Schwarze dealer in Alabama, was more than happy to lend its support and demo area for the final day of the recent three-day United States dealer demo and meeting held Oct. 17 to 19. Barber Motorsports Park and Museum in Birmingham served as the venue for the meetings and social events. The 830-acre park features a 16-turn, 2.38-mi. road course and exquisite meeting and classroom facilities overlooking the Barber Motorsports Museum, which features a wide array of motorcycles restored to virtually new condition. Nearly 100 guests arrived on day one to enjoy an evening dinner in the motorsports museum. Day two was jam packed with classroom training sessions on the new HyperVAC sweeper and outdoor machine walk around demonstrations in a setting overlooking the road course. During breaks, attendees had the opportunity to watch cars testing at the Barber Motorsports track. A total of 38 United States Schwarze dealers were represented at this event. In conjunction with the demo, Schwarze conducted a year-end dealer meeting. The meeting focused on new automation to enhance several aspects of placing orders and sales and marketing functions. Departments had the chance to address all of their internal improvements and new technologies, and the event also provided an opportunity to review all of the new engine offerings and new machine variants available to the company's customers. Day three kicked off with an inspiration speech from special guest, Dan Quiggle, keynote speaker and renowned author. Quiggle's speech centered on managing companies and personal and business leadership. At the conclusion, all guests received a signed copy of his latest book, Lead Like Reagan: Strategies to Motivate, Communicate, and Inspire. The concluding session of the three-day event moved to the headquarters facility of Schwarze dealer, Tractor & Equipment Company (TEC), based in Birmingham, Ala. Dan Stracener, TEC president, welcomed his fellow dealers and provided a tour of the facility and a demo area. While there, guests experienced a live demo of the new Schwarze HyperVAC. The designated demo area had a full spread of debris, including gravel, sand and other material — leaves, sticks, etc. The machine made quick work of picking it all up. After the demo, TEC provided lunch to the attendees from one of the south's premier barbeque joints — Dreamland Barbeque. Schwarze Industries' representatives said that it was a good year for Schwarze and that this year's meeting was a tremendous success. 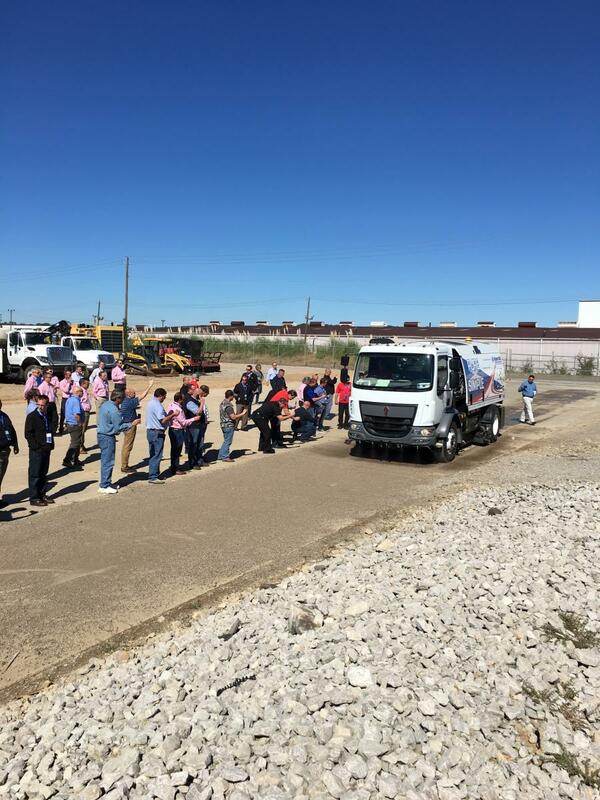 The sweeper truck at the front and center of the demo event was the 2018 Schwarze HyperVAC, which is termed the 7.8-yd. pure vacuum sweeper. The new technology behind this new product combines mechanical sweeping and regenerative sweeping into one highly effective machine. The design is not simply a traverse broom style, the design incorporates the “floating” broom design, which is similar concept to the floating head razor. When sand, mud and muck are imbedded into pavement or a milled area, the bristles of the brooms dig down and remove the debris while conforming to the contour and slope of the roadway. The machine has applications in both the municipal and construction industries. Built in Huntsville, Ala., the sweeper is primarily built on Kenworth, Peterbilt, or Freightliner truck bodies. The machine will be available in January 2018.